As readers of this blog well know, I am passionate on topics related to semantic technologies, knowledge graphs (ontologies), data structs, and artificial intelligence. Readers also probably know that I have found Charles S. Peirce, the 19th century American logician, scientist, and philosopher, to have remarkable insights on all aspects of knowledge representation. 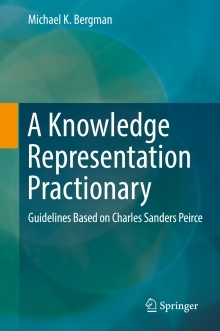 I’m proud to now announce my new book, A Knowledge Representation Practionary: Guidelines Based on Charles Sanders Peirce (Springer), that combines these viewpoints into a comprehensive whole. The 464 pp book is available for pre-order from Springer or from Amazon (and others, I’m sure). Formal release is due the second week of December. Peirce’s practical guidelines and universal categories provide a structured approach to knowledge representation that captures differences in events, entities, relations, attributes, types, and concepts. Besides the ability to capture meaning and context, this Peircean approach is also well-suited to machine learning and knowledge-based artificial intelligence (KBAI). Peirce is a founder of pragmatism, the uniquely American philosophy. We have already used this viewpoint to produce the KBpedia knowledge base and artifact, which we just released as open source. My book combines that viewpoint with the experience that Fred Giasson and I gained over the past decade with commercial clients in semantic and AI technologies. While KBpedia and the book stand on their own and do not depend on each other, they do reference one another, and those with serious interest may find it useful to keep KBpedia open as they progress through the book’s chapters. I use the term practionary for the book — a decidedly new term — because the Peircean scholar Kelly Parker first coined that term to capture Charles Perice’s uniquely pragmatic way to fully explicate a particular domain of inquiry. In our case, of course, that domain is knowledge representation, which is shorthand for how to represent human symbolic information and knowledge to computers to solve complex questions. KR applications range from semantic technologies and knowledge management and machine learning to information integration, data interoperability, and natural language understanding. Knowledge representation is an essential foundation for knowledge-based AI. The practionary approach is a soup-to-nuts way to fully apprehend a given topic. To my knowledge, the book is the first attempt to put this Peircean method and framework into action. I structure the book into five parts, following Peirce’s own approach. The first and last parts are bookends. The first bookend sets the context and background. The concluding bookend presents practical applications from following the guidelines. In between, the three main parts mirror Peirce’s three universal categories, the meat of his approach. The first of these three addresses the terminologies and grammar of knowledge representation. The next discusses the actual components or building blocks for KR systems. And the third provides what generalities we may derive about how to design, build, test, and follow best practices in putting a system together. Throughout, the book refers to and leverages the open source KBpedia knowledge graph and its public knowledge bases, including Wikipedia and Wikidata. Actual practitioners may find KBpedia, built from the ground up on these Peircean principles, a ready baseline to build their own domain knowledge graph and applications. My intent is to produce a book of enduring, practical guidelines for how to think about KR and to design knowledge management (KM) systems. I emphasize how-to guidance and ways to think about KR problems. The audience in my mind are enterprise information and knowledge managers who are contemplating a new knowledge initiative. However, early reviewers have told me the basics are useful to students and researchers at all levels. I am not even-handed in this book. My explicit purpose is to offer a fresh viewpoint on KR as informed by Peirce and our experience in building systems. For more balanced treatments, I recommend the excellent reference texts by van Harmelan et al. or Brachman and Levesque. Still, for those looking at the practical side of things, I hope this book may become an essential addition to theory and practice for KR and semantic technology. Peirce has a profound understanding of meaning and context that I believe is of benefit to knowledge management practitioners and AI researchers alike. Individuals with a Springer subscription may get a softcover copy of the e-book for $24.99 under Springer’s MyCopy program. The standard e-book is available for $129 and hardcover copies are available for $169; see the standard Springer order site. Students or individuals without Springer subscriptions who can not afford these prices should contact me directly for possible alternatives. 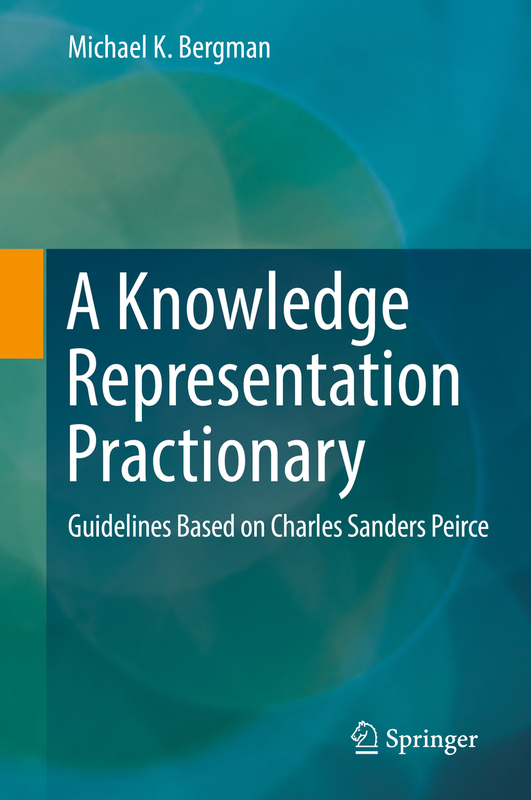 Michael K. Bergman announces his new book, A Knowledge Representation Practionary: Guidance from Charles Sanders Peirce. The book applies this guidance to the question of how to best represent human knowledge to computers. The book's practical guidelines should be of interest to any enterprise KM manager, AI researcher interested in knowledge, or Peirce scholar. I have been following you and your work for many years and am glad about your book. But I am semi-retired on a minimal income so conserving money while I establish my next step. I likely won’t buy such an expensive book. I have also stopped supporting Springer. I have admired your open source initiatives and at the same time can understand the need to monetize your lifetime’s work. And I am sure, while a labor of love, it was also significant labor, and of significant value. So Kudos. Not sure you will actually make money on this, but my experience with this kind of publisher is they reach a narrow academic audience and not the broader independent audience. No critique, but was hoping the book would be cheaper or more accessible. Perhaps, I might be able to read it from my O’Reilly subscription where I access most technical books. Even so, I may ultimately buy it due to my lifelong habits of having to own books I desire. But I have found over the last several years, I am reading less of the books that line my walls. I find myself reading deeper rarely, and only into key people like Peirce, but am actively listening to podcasts and watching video more. As is the digital generation of my kids. However, all the people I actively support, I support directly now. I have thin streams, around $60/year each going to several people making contributions I value. And am actively supporting new methods of content monetization. I was hoping you would be following the trend of putting your publication out on the blockchain and monetize it through the “basic attention token” and its promotion through the “Brave Browser”, or through the “Steem” blockchain, or simply through using Patreon or donations or other web site funding mechanisms. In fact, your earlier work on the AI3 site, even the work you somewhat disavow as you grew in understanding, and as AI grew in its abilities, as you and it evolved, is I think extremely valuable. And probably not as widely known as it should be. If you look at the BAT project and Brave, I think you could, as a content creator, get much more value (e.g., income), and add much more value to the world, through this evolving replacement of the current advertising based web. At the moment, I think YouTube channels are even beginning to earn BAT now. I know you are an active researcher and explorer so ignore the links if you already follow them. But I know you have been heads down writing and may not have followed these edge trends over the last couple of years. Hope that helps. And hope you can earn a living on your content as well as whatever you get from your various other endeavors. Your practical experience, research/thinking/synthesis, and your ability to write clearly is a rare combination and valuable. Anyway, I am an admirer and would love to see your work more broadly disseminated. Smart people can take it up better than most of the academic work (vastly inaccessible) or groups (e.g., Ontolog – the philosophical/practical, arguing, and growing edge) I follow. I may ultimately buy the book, but would really prefer a audio/video channel/series or a course. I have heard you speak and think you would do well with courses. Or better yet, later, do what I am trying to figure out, how to create progressive websites, that move from basic pages, to increasingly more interactive, visual, and ultimately immersive approaches that are becoming available through virtual/augmented reality (e.g., WebXR). Become the site everyone goes to learn about it. And return to relearn. And be funded through these mechanisms. That community is working out the standards now, but still in rapid flux, not to mention the next wave, where they add the progressive and responsive needs of the media, the hardware, and audience. Not to mention the new Web 3.0 (as opposed to the old Web 3.0) of the decentralized web. Or the Tim Berner’s Lee emerging SOLID next web. A big change is underway, right now, and I think it a good time to begin moving that way. But I am bleeding on some of those edges so wouldn’t recommend them yet except perhaps in a longer term experimental, emergent approach. Your work is rich, deep, and useful. It could be put to active use in many places. Thanks for what you have been doing. Hope you take some of the knowledge and insight of your life out into video, online courses (e.g, Udemy, EdX, MITOnline), or other places to grow the world’s understanding. Or deepen your own, owned, content site. If you want to talk about any of this, I’d enjoy the conversation. Thank you for your kind words and compliments. I very much appreciate the time you spent in penning this comment. if i may, let me explain a couple of things. First, i have zero expectation of making any money from this book, and that bore no reason for why i wrote it. I originally planned to self-publish and keep the price as low as possible, but i was convinced to float it to a publisher. i actually did not expect a publisher to bite — I’m not an academic with the requisite pedigrees — but I got an immediate and positive response from Springer and decided to go with them. I did so because I wanted to see broader distribution into institutional libraries and wanted to learn about STEM publishing from the inside out. I was given some assurances of ultimate price of the book that were not kept as the book grew in length. Oh well, i did learn much from the process and i walk away thinking that academic publishers are very much between a rock and a hard place keeping their business models relevant going forward. Second, I did write the book because i felt compelled to do so. Like leaving some of our legacy in our children’s DNA, i think it is important that we also leave our cultural information in a form useful to next generations. i have no idea if my contributions have lasting value or not, though I do hope so, but they definitely would have no value if never expressed in a form useful to others. I judge established publishers provide a better insurance of that preservation, but who knows? if you read the last sentence in my announcement, i did signal my intent to try to find a way for anyone who really wants to read this book to be able to do so in an affordable way. As they say, this book, and KBpedia, too, are labors of love, and not mammon. i will make separate outreach to you on this matter. I wanted to buy your book but I only found it at a price range like $150-$160. Is that an error? Where should I buy it? See the last sentence of my announcement. Contact me directly if you do not have a Springer subscription. Congratulations, Mike! I’m only on chapter 7 but I have certainly gotten my money’s worth. I hope enough people practicing knowledge representation for their livelihood see past the price and give it a chance. It is hard to spend too much on useful knowledge. Wow, thank you. Please let me know what you think after you have gotten through the material you wish. I very much welcome feedback and suggestions for improvements. And, yeah, I’m disappointed with the price, too. I will work to do what I can to get versions available for lower prices over time. Thanks, again, Brian.